As teaching candidates you may have to do a practicum experience as part of your coursework. Going into your first practicum experience can be a little scary. It can be hard to know what to expect, or sometimes even what is expected of you. The following are some tips for you to get the most out of your practicum experience. On the first day of your practicum you don’t really know what to expect and I think this is a good thing. Even if you have had some phone or email conversations with your cooperating teacher, it is so important to keep an open mind about your placement. I have been very fortunate with all of my placements and have seen a lot of great teaching at work, but some of my peers haven’t been as lucky. If you get placed with a teacher who has different teaching styles or methods than yourself, embrace it as an opportunity to learn. Some placements will show you methods that you want to try in your classroom someday, while other placements will show you methods that you absolutely don’t want to use in your classroom, and this is okay! If you get placed in the second type of setting in order to get through it, it is so important you make sure you keep an open mind and look at it as a valuable learning experience rather than a placement that is teaching you nothing. Know what you need to do for coursework in the field. It is very important to know exactly what you have to complete for your courses the first time you step foot in the classroom. I know that this can be sometimes hard information to get because the syllabus isn’t quite clear on what you exactly you are supposed to be doing, but even if you don’t know the specifics of the assignment, it is important to know it exists. The amount of coursework that you need to do while in the field can sometimes seem overwhelming from time to time. The best way to ease some of the stress is to start early. I recommend making a checklist for yourself and your cooperating teacher before your first day in the field with all of the assignments you need to complete. This will make it easy to stay organized and stay on track (and will likely impress your cooperating teacher). When you complete an assignment it is also very important to type up your lesson plans and reflect on the lesson as soon as possible. Otherwise it is easy to forget specific details that will help you in the future. If you put off typing lesson plans, you will be very overwhelmed when you come back to school. For instance, this semester I would have about 20 lesson plans to type and this is not always a short and easy step even if you have already taught the lesson. Collaborate with others at the same site or in the same grade. In my past placements I have not had any other teaching block students in my school in the same grade level. It was kind of lonely, but I got through it. There were students in my block who were in the same grade, but at a different school or in the same grade at my school but in a different block, but I did not take advantage of this. This semester, however, I have two fellow block students in the same grade at the same school. We have done a lot of collaborating and lesson planning together and it is amazing what a difference it has made! This semester I have felt so much more confident in my lessons and happier in my placement. Being able to bounce ideas and suggestions off of one another has been the most amazing and helpful part of this experience. This is something you will have to do with grade level teachers once you are in the field. By collaborating with your peers in a similar situation you are gaining experience as well as keeping yourself sane throughout the semester! If you don’t have peers to bounce ideas off of, your cooperating teacher is also an amazing resource. They are there to mentor and guide you, so don’t be afraid to show them a lesson or bounce ideas around with them for lessons. Ask them as many questions as you want, and need, because that is the best way to learn. Don’t put too much pressure on yourself to be perfect. I hope that these four tips will help you to have a successful practicum experience and to get the most out of your practicum experience. The most important tip is to have fun and learn as much as possible! It can be stressful, but your experiences are where you will learn the most about teaching in a classroom and everyday is preparing you to be a better teacher! As a teacher candidate, you might have several positions that sound very similar before you get experience such as student teaching or even your first full-time position. You might have done some assessing or behavior management, which are great to put on a resume, but since you aren’t taking over the classroom yet. It can be challenging to show all of your experiences without being too repetitive. The following is an example of one way you can avoid this problem as pictured on page 33 of the Career Handbook. By combining your positions as a classroom volunteer or a practicum student teacher as pictured above you can give employers the gist of what you did while saving room for other positions you have held, without being too repetitive. If you have two experiences that are very different from one another, this method is not the best option because you likely have very different things to say about each position. For instance, this semester my practicum experience is in a classroom that is 1:1 with iPads. This experience looks VERY different than some of my past experiences where I have been in a very low tech school and in a lower grade. Since these positions are so different, and I would like to highlight how I have used technology in the classroom in my latest experience combining experiences as shown above, is not the best option for my resume. If you do choose to set up your resume in this way, I would recommend you set it up by similar age groups because assessment and behavior management techniques look very different for kindergarten as compared to 6th grade. I would also recommend to split out special education and general education experiences as these experiences will likely look very different. When using these techniques you may have to be a little more generic with your wording so that it fits with the positions. For instance going off the example above, I wouldn’t say that I worked with three students with a specific learning disability because that statement wouldn’t be true for all positions. Instead, you would list it as the example states above (Assisted teachers in providing consistent classroom management according to individual behavioral needs and plans.) because this is likely accurate information for all of the positions you have listed. When talking about your student teaching experience, consider having this be a separate description and possibly even give it it’s own section. This is because you spend a lot more time in the classroom when you are student teaching. You also have more responsibility and control over the classroom so this is information you will want to highlight on your resume. Other really great information pieces to include on your resume are specific details such as whether or not you have done behavioral or academic interventions, stating specific disability groups you have worked with content area topics you have taught, or specific strategies you have used such as guided math, flipped learning, or gamification. If you can give any data with information such as an intervention, this could make you stand out in a group of applicants, especially if you were successful. If you weren’t successful, this could be a great talking point while in an interview. You could discuss what you tried, what didn’t work, and where you went from there. By combining similar positions on your resume you can not only reduce repeating yourself over and over, but you can also save yourself space for other positions that are related that you would like to have on your resume. If you choose not to combine positions, make sure you are choosing facts about each position that make it different from the ones you already have on your resume. By spreading out the descriptions you likely do in all experiences, you can give solid descriptions of what you did at each one rather than having your resume be generic. While things like assessment and behavior management are important, so are skills such as using technology and interventions. Make sure that you hit all of these skills in your resume rather than just telling them information that you think employers want to hear. Remember, you want to make yourself stand out by highlighting what kind of teacher you are and where you are going to go in the future! What do I Put in a Teaching Portfolio? As a teacher candidate, I have heard several times from professors and principals that I should have a portfolio. The problem is, I have no idea what I should put in my portfolio or where I should be keeping my portfolio. The American Association for Employment in Education (AAEE) publishes a Job Search Handbook for educators every year. I found the section “Successfully Marketing Yourself Through the Use of an Electronic Portfolio” to be very helpful. You can pick up one of these handbooks in our office! One major point this section made is that a well put together portfolio can either make or break you in the job search. The overall layout and design of your portfolio can have a lot to do with whether it will make or break you. You want to make sure your portfolio is easy to follow and that your design or “decoration” doesn’t get in the way of the content of your portfolio. The first part of your portfolio that the employer will see is your Welcome Page. This doesn’t have to be a big long welcome, but it should introduce you as an educator. AAEE recommends including a professional picture of yourself or an original picture that represents you positively as a teacher. This could be the same picture that is on professional networking sites such as LinkedIn. A nice aspect of an online portfolio is that you can include audio or video clips to introduce yourself or a concept to future employers. This could be an original addition to your portfolio that will help you to stand out to future employers. If you choose to include an audio or visual clip, I strongly recommend including subtitles to your video to show that you are sensitive to the topic of accessibility. When creating or selecting clips for your portfolio, it is important to make sure that they are high quality and professional. Plan and implement standards based instruction. Collaborate with others including peers, community members, parents, etc. Similar to when you send an electronic version of your resume, you will want to save any uploaded documents as a PDF before uploading them so the format stays the same no matter what type of device the employer is using to open the document. It is important to make sure that these documents are accessible, so consider asking several friends and family to open the document to make sure that it is available. If the documents aren’t accessible you will loose all effectiveness and it will not reflect well on you as a teaching candidate. If you are going into the teaching field, you often hear about creating a teaching portfolio or a job search portfolio. I had another teaching candidate ask me just the other day, “How important is a job search portfolio?” I told them I knew it was important, but I wasn’t really sure the exact reasoning behind it, so I decided to do a little research on it. The American Association for Employment in Education (AAEE) publishes a Job Search Handbook for educators every year. In this handbook there is a section called “Portfolios in the Job Search: Busy Work or Competitive Edge?”. There are some employers, in this case school districts, who don’t ask for portfolios especially in the first or second rounds of interviews. This brings up the question if they don’t specifically ask for a teaching portfolio, why would I take the time to put one together? By having a well put together portfolio in the first and second rounds of interviews, you can make yourself really stand out. You will show that you are highly motivated and that you really want the position they are hiring for because you took the time to go above and beyond what they specifically asked for. You are also showing them examples of your work, which will give them a better idea of how you work as a teacher and your effectiveness as a teacher. Portfolios are a great way to show employers what your strengths are in the field. By having a visual of these strengths to bring up during an interview, you will make a longer lasting impression on the employer than just talking about the examples. There are also some lessons that you are very proud of that you want to highlight, but they are too complicated to just discuss. Having this visual will allow you to effectively show the panel an example of your work and you will also showcase your teaching ability when you are explaining the lesson to the employer. This kind of makes it a two for one! There are many different formats that you can choose when you are creating a job search portfolio. You may choose to create a binder, streamlined packet, brochure, or an electronic portfolio. There are pros and cons for each of these formats so you will have to choose the one that you think will work best for you. Binders can be a great way to show your organization skills. By having a binder with examples of your work the employer will have a tangible example of your work. You can use color-coded tabs that allow you to reference certain items during the interview and they will be able to go look at those examples. There are two major cons of doing a binder portfolio, in my opinion. The first is that you will really have to know where everything is in the binder because it will be really hard for more than one person to look at it at one time. The second is that the employer will likely ask to keep the portfolio for a period of time so they have time to actually look at the portfolio you put together. This means if you have another interview in a short period of time following another, you may not have your portfolio back to share with another employer. The second option is a streamlined packet. This is a document that is less than ten pages long where you can give highlights of your experiences through showing work samples and photos. One really nice part of using this format is that it is short enough that you can print a copy for each person on the panel. It is also nice because it is very short and to the point so employers will be able to look through it without spending too much time. While it is nice because it is concise, I think that this is also its biggest downfall because you have to be a little pickier about what to include and what to leave out. This may mean that you have to leave something out that you really want to include because of a lack of space. The third format is a brochure. This is a really quick and easy way to show your strengths and highlight aspects of your career. The AAEE Handbook suggests passing out these brochures at job fairs or networking events or including a copy of the brochure with a thank you letter. The biggest obvious downfall of using a brochure is the lack of space. This being said, I wouldn’t recommend using this on its own, but I think that using this as noted in the handbook is a great idea! The final format is an electronic portfolio. What is really nice about creating an electronic version is that you can put a link to it on your resume and employers can access it if they want before you come in for an interview. It also allows you to tailor your portfolio toward each employer and add videos of you teaching. One downfall about having an online portfolio is that you have to make sure that all of your information is accessible. You should also make sure where you are posting your portfolio is secure if you have pictures of students. Even though an employer might not ask for a portfolio in the first round of interviews. Having one that you can show them can be a great way to help them to remember you and show examples of your work. In an upcoming post, I will be talking about what you should consider putting in your portfolio. There are many certificates that someone can get that will help him or her to get a leg up in the teaching field. One of the certificates that is offered at UMD is the Educational Computing & Technology Certificate. This certificate is composed of four, four-credit classes that teach you how to use technology in the classroom and for administrative tasks. Technology is becoming more and more important to school districts hiring new teachers. They need teachers who can keep up with the students who they are teaching. By getting this certificate, you will have a great certificate to add to your resume, and you also have a great amount of knowledge that can help you to be more efficient in the classroom. Since the courses are only offered certain times of the year, I have found it very helpful you don’t have to take the courses in any particular order. The only exception to this is the first course in the series, as it is a prerequisite for the other courses. While it is nice you can take the courses in any order, you can plan your schedule to take the classes in order by course number. This could be very beneficial since many of the professors assume you have taken the previous classes. Since the courses are only offered during certain semesters, you really have to pay attention to when the courses are offered so you have time to fit everything into your schedule. The first course in the certificate is EDUC 2000: Technology for Teaching and Learning or EDUC 5412: The Computer in Education. Either of these classes can count for completing the certificate even though they each have a slightly different focus. The Technology for Teaching and Learning course has a focus for working with elementary age students. This course teaches you to use tablets, SMART Boards, and other tools such as Excel and Prezi to enhance lessons in the elementary classroom. This course is offered in the spring and fall every year. The Computer in Education course has a focus on various operating platforms and teaches students how to use basic software used by teachers in the field. This course also teaches various tools to be used to enhance lessons. This course is offered in the fall, spring, and summer every year. The next course is EDUC 5413: Teaching with Technology. This course is offered in the fall, spring, and summer every year. This course looks at more tools for teaching and assessing the effectiveness of using technology for various lessons and looking for the most appropriate tools to use with lessons. You will also learn about topics such as universal design for learning, teaching digital citizenship, SAMR Model, and ISTE-T standards. The third class of the certificate (if you are taking them in order) is EDUC 5414: Using Technology for the Administrative Task of Teaching. This course is offered only in the fall of each school year. This course focuses on the background knowledge needed for various tasks of teaching with technology. The course discusses various technology conferences, assistive technology, and what it takes to be on a technology committee, and what tasks are involved with being the technology director at a school. This course also looks at how to write grants asking for technology and designing a 21st century classroom. The final course is EDUC 5415: Teaching Online and Hybrid Courses. This courses covers topics such as copyright, free use, instructional design, and creating learning activities in regards to teaching classes that are either completely online or are partially online and partially face-to-face (hybrid courses). You also have the opportunity to design your own online course using the university online system. This course is offered only periodically in the spring. I have found that the courses in this series have been very useful in my teaching experiences while I am in the field. This semester I have the opportunity to integrate a lot of what I have learned into my classroom because there is so much technology available to the students. The classroom has a SMART Board and the students each have their own iPad. In a world where technology is on the rise, education administrators are looking to hire teachers who know about technology and who want to incorporate it into their classrooms. This certificate is an excellent add-on to any teaching degree to give you more knowledge about the technology used in classrooms and how to effectively incorporate technology into the classroom. My previous blog post “What Tests are Needed to Become a Teacher in Minnesota” talked about the various Minnesota Teacher Licensure Examinations (MTLE) that need to be taken in order to get your teaching licenses. The total cost of taking these exams if you have to pay the annual fee of fifty dollars for each separate test section is $675. Since my last blog post, Minnesota Department of Education has decided that if you scored a 22 or higher on your ACT you no longer have to take the first portion of the exams which are the MTLE Basic Skills Tests. 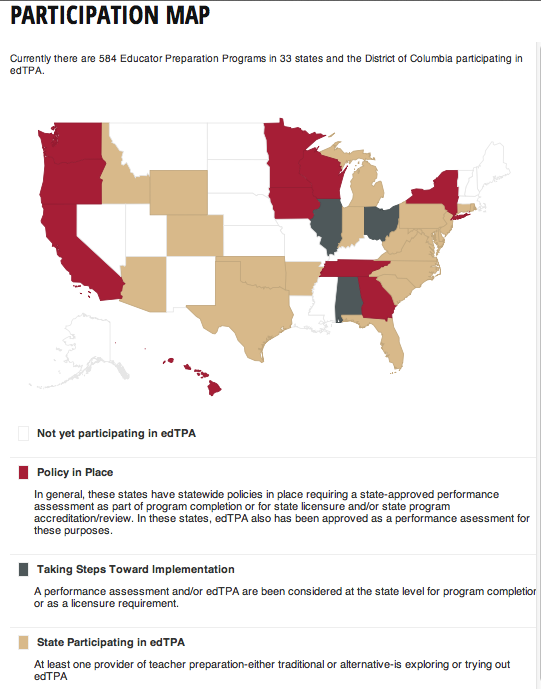 This blog post is focusing on the Education Teacher Performance Assessment or more commonly known as edTPA. The edTPA is a performance evaluation where teacher candidates demonstrate skills that are needed in the classroom. It is becoming a stricter requirement for initial teacher licensure for many states including Minnesota. There are several components to the edTPA including: planning, instruction, analysis of teaching, assessment, and academic language. Teacher candidates are required to supply the following: lesson plans, assignments, and video and classroom assessments of learning. One of the benefits of the edTPA is that it will provide universities more groundwork on what to teach teacher candidates in order to prepare them for their own classroom someday. As of right now, it is not required that teacher candidates pass the edTPA, but it is very possible that this will change in the very near future. Scores are shared with the teacher candidates and their college or university. In the past it is up to the teacher candidate whether or not they would like to share their scores. When it comes to the hiring process, it is up to the administration of various school districts whether or not they would like to ask for the scores of their potential hires. It is also up to the incoming teacher whether or not they would like to share their scores. The edTPA in the eyes of many teacher candidates is that it is just another step that they now have to take in order to get their license. While this is true, the main purpose is to make sure that incoming teachers are as prepared as possible for when they have their own classroom. The edTPA gives student teachers an opportunity to really evaluate their teaching and how their students are learning. This means that it is meant to help improve their teaching for both themselves and their students. It will also help institutions to evaluate their teacher preparation courses. The cost of the edTPA is $300. This brings the total cost of testing and the edTPA to $975 if you pass the first time and you have to pay the annual fee for each section of the MTLE tests to become an Elementary and Special Education certified teacher in the state of Minnesota. This total will vary based on content/subject area.